Fix “My iPhone is frozen and won’t turn off” without Hassles! Help!! My iPhone 6 is frozen on the lock screen and won’t turn off or reset, how can I fix it, any suggestions? Please help, your suggestions are greatly appreciated. Thanks! The iPhone is frozen and won’t turn off issue is very common. A frozen iPhone can disrupt your work since you won’t be getting your emails and important calls. To make things better for you, we will show you how to fix this issue. The following methods can work for iPhone 4/5/6/6s/SE/7/8/X. Step 1: In quick succession, press and then release the device Volume Up button. Step 2: Quickly press and then release the device Volume Down button. 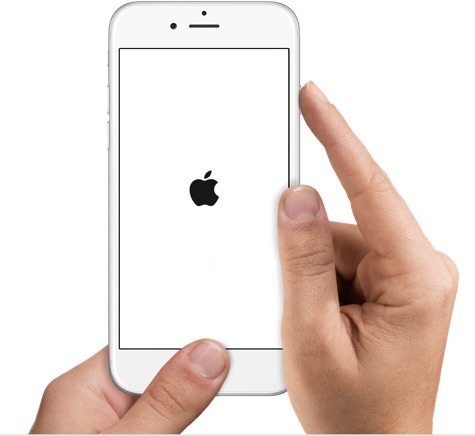 Step 3: Press and keep holding the Side button until an Apple logo shows on the screen. Step 1: Press and keep holding both your sleep/wake and the volume down buttons. 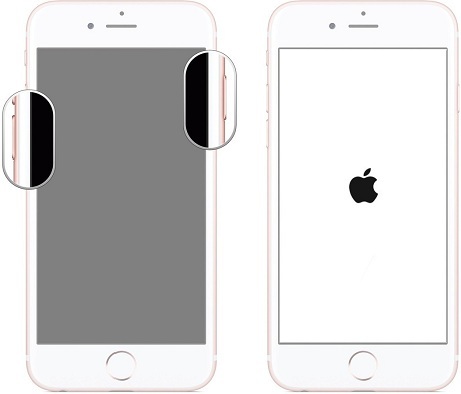 Step 2: Release the buttons when you see an Apple logo on your iPhone 7 screen. This will take about 10 seconds tops. Step 1: Press and keep holding both the Home and the Sleep/Wake buttons. 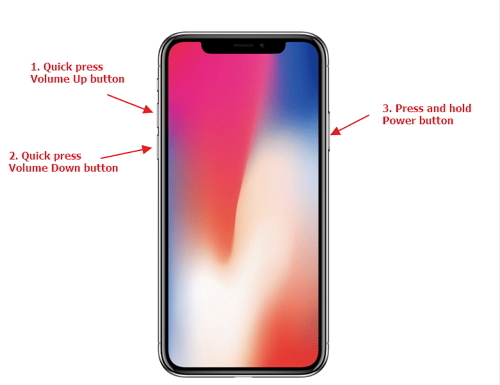 Step 2: Release both buttons when you see an Apple logo on your screen. This takes approximately 10 seconds. Step 1: Launch iTunes on the computer you used to back up your iOS device. And connect your device to the computer using a USB cable. If asked to Trust This Computer or for a passcode, follow the onscreen instructions. Step 2: On iTunes, select the iOS device when it appears. Tap Summary on the left-hand column below your iPhone. 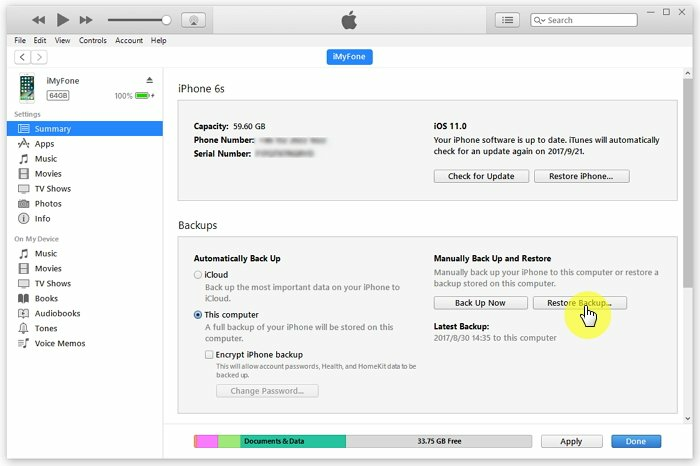 Step 3: Choose Restore Backup in iTunes and then choose a relevant backup to restore to the device. Step 5: Tap Restore and wait while the device is being restored. If your backup is encrypted, a passcode will be requested. Enter it to proceed. You will need to keep your device connected even after it restarts. Disconnect your iOS device after it has finished syncing with your computer. If you are like everyone else, avoiding the frozen iPhone issue will be better for you than having to fix it. In most cases, the main reason that causes an iPhone to be frozen is the junk and temp files in your iPhone. If these are cleaned regularly, you will never have to complain that your iPhone is frozen and won't turn off. Clear crash logs – Umate pro will clear any redundant application crash logs and system usage reports generated by your iOS. 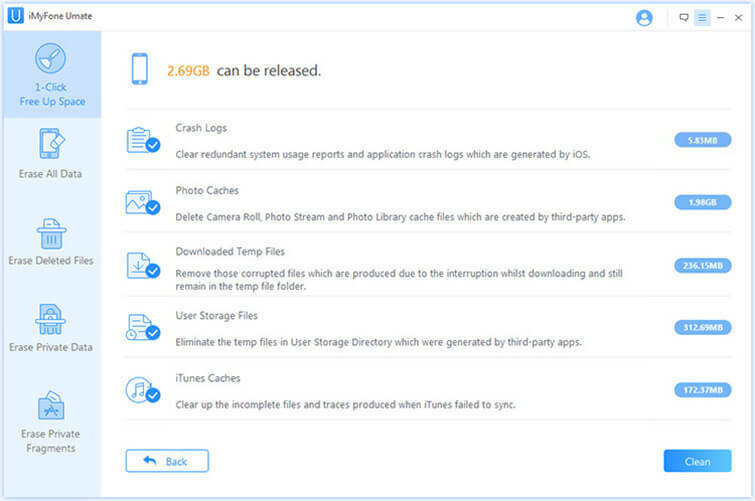 Delete photo caches – The tool will delete Photo Library, Photo Stream, and Camera Roll cache created by third-party applications. Clear downloaded temp files – These are the corrupted files generated as a result of interrupted downloads. Eliminate user storage files – Umate Pro will delete temp files present in the User Storage. These are generated by third-party apps. Clear iTunes cache – These are incomplete files produced by iTunes when syncs fail. Step 1: After launching iMyFone Umate Pro, connect your iOS device to the computer using a USB cable. Step 2: Tap the first option on the left-hand column of iMyFone Umate Pro home screen. The option is “1-Click Free Up Space”. 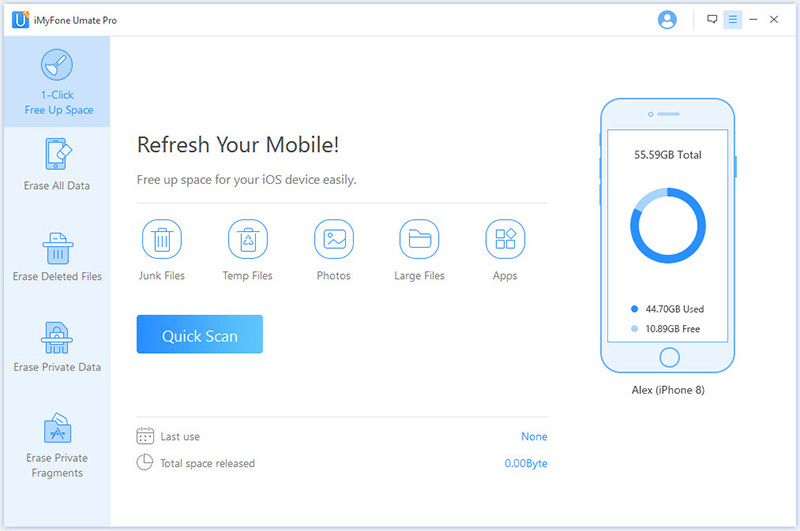 Tap the Quick Scan button and wait while Umate Pro detects the junk and temp files present in your device. Step 3: Click Clean next to all the useless data detected by Umate Pro to erase it. It can help you erase any data permanently by overwriting it. You can erase any previously deleted data to make it irrecoverable. It allows you to preview and then erase data selectively. You can easily erase third-party application data.